Rav Elyashiv was the son of Rabbi Avraham Erener and Chaya Musha, the daughter of the kabbalist Rabbi Shlomo Elyashiv known as the Leshem. 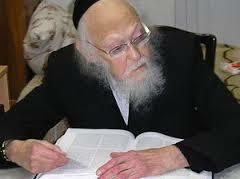 Born in 1910 in Šiauliai, Lithuania, Rav Elyashiv was the only child, born to his parents after 17 years of marriage. He arrived with them to British Mandate Palestine in 1922 at the age 12. His father adopted his father-in-law's surname, Elyashiv, in order to gain a certificate to enter the country at the advice of the famed Chofetz Chaim of Rodin, Poland. Although Rav Elyashiv never attended a formal yeshiva framework, he was recognized as a genius in Talmud study at a young age. He was appointed as a Rabbinic Court Judge (dayan) to the High Court of the Chief Rabbinate of Israel by Israel’s Chief Rabbi at the time, Rav Yitzchak Herzog – who exempted him from the rabbinical examinations due to his high level of scholarship. He resigned from this position in 1972 and for the next 40 years of his life, held no official positions. Although he never wrote any Torah works, his family members and students wrote down numerous volumes of his halachic rulings and Talmudic insights, while he devoted all of his time to his incessant studies and daily lectures. Rabbi Elyashiv's daily schedule began at 2 a.m. and included anywhere between 16 to 20 hours of intensive Torah study – despite the fact that he was stricken with several illnesses throughout his childhood and adult life. On one occasion, members of his household noticed that he had been standing during his learning and asked why he did not sit down. He answered that since he was tired, he feared that he may drowse while learning. If he stood, he would be sure not to doze off. Rav Elyashiv used to receive visitors from around the globe on a daily basis in addition to leading rabbis and politicians of Israel, answering their complex halachic inquiries. Despite his advanced age and illness, he continued responding to questions from rabbis around the world with total lucidity until the very end. Even when he was sick in hospital, he continued to rise at 2:00 a.m. for his regular studies.